The mouse, keyboard and numerical keypad, can be configured to fully adapt to the applications that run on remote servers. 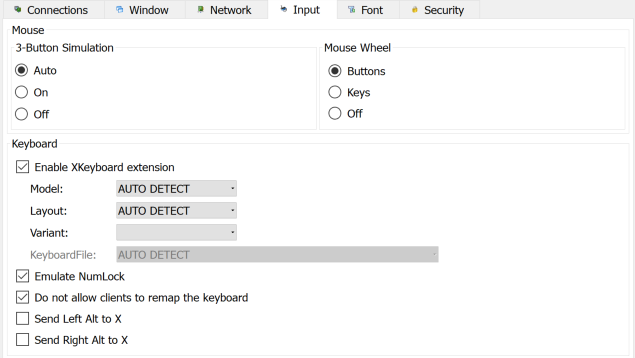 This may be needed when the three button mouse is needed for the remote application, the application is setup for a keyboard interface to a different language, the numerical keypad needs to be setup for the application. Older Mice only had 2 buttons. The middle mouse button could be simulated by clicking both the left and right mouse button at the same time. 3 button simulation gives the user the choice to set this feature if needed. Auto is the default setting for mouse input. X-Win32 detects the number of buttons on the mice and sets the functionality to on or off accordingly. When On is enabled, the middle button of a 3-button mouse is simulated by simultaneously clicking the left and right mouse buttons. This 3-button feature is often needed for remote applications. When Off is selected, no configurations are applied; the mouse is used as is. This should only be used when you are using a 3-button mouse at your local workstation – most remote applications are setup to interact with a 3-button mouse. Buttons is the default option. Mouse wheel up and down are set. is mapped to the down arrow. MouseWheelUp and MouseWheelDown are turned off. The remote application will only detect 3 available mouse buttons. The X Keyboard Extension allows X-Win32 to use X Keyboard Maps which extend the ability of typical key maps. These key maps allow specific keyboard configurations for which match most keyboards in use today. Turning off the X Keyboard extension will allow old style key maps to be specified manually. Select the default keyboard model. If set to Automatic, X-Win32 will choose the keyboard model based on the Windows system settings. Send the actual number when using the keypad rather than the keypad button. For example when Emulate NumLock is enabled, and you press the "7"button on the keypad, the key send will be the same keycode as "7" on the top of the keyboard. With emulate NumLock disabled, the keycode sent will be KP_7. On certain Operating Systems (most notably AIX), the NumLock button is treated as a keyboard modifier (like SHIFT or ALT) and modifies all keys on the keyboard. Enabling this feature works around this issue. The default setting is disabled. Checking this option will allow the Left Alt button to be sent to the remote host rather than being intercepted by the Windows Operating system. Checking this option will allow the Right Alt button to be sent to the remote host rather than being intercepted by the Windows Operating system. This will set the input method to support IME. You can also export these environment variables (LC_CTYPE and XDMODIFIERS) in your login profile.